We got up and headed up to the Lodge for breakfast - a nice buffet (Mathea had chocolate chip pancakes, but wasn't very hungry for them - probably due to lack of sleep). We checked out of the cabin, took a few pictures, and headed up the road back to Virgin. On our way, we stopped by a geocache that was placed next to a working fire tower. Mathea and Nate climbed the tower (which was advertised to be 80 feet tall, but was actually well over 100). At the top, we met the ranger, Mark, who opened the trap door for us then stood on it while he went over the major viewpoints, and wouldn't let us leave until he was done. Mark loves having company (grin). He was really nice to talk to and knew the area very well. We made a brief stop by the Vermillion Cliffs Viewpoint. The view of the Vermillion Cliffs was neat, but the building they put together (which you can't see from the road) was equally interesting. They also had a number of folks selling jewelry at tables in the parking lot, and Mathea fell in love with a horse necklace and bracelet, so we picked those up for her. Mark from the fire tower had recommended a place called Houston's Trail's End Restaurant in Kanab, UT. We were in Kanab about lunchtime and decided to follow his suggestion and stopped there for lunch. He was right - it was excellent. Just be sure to tip your server, she's packing. We also made a stop by Moqui Cave (mostly because there was a geocache in the parking lot). They had a neat-looking and affordable museum, but we needed to get moving to make it through the Tunnel and back to the motor home at a reasonable time, so we moved on. We then got on Route 9 and re-entered Zion National Park so we could drive through the Zion-Mount Carmel Tunnel to get back to the RV park. The tunnel can only accommodate large vehicles in one direction at a time, so there's frequently a wait, but it's a really neat tunnel. There are two galleries in the tunnel that open up to the canyon, but unfortunately cars cannot stop at them any more. 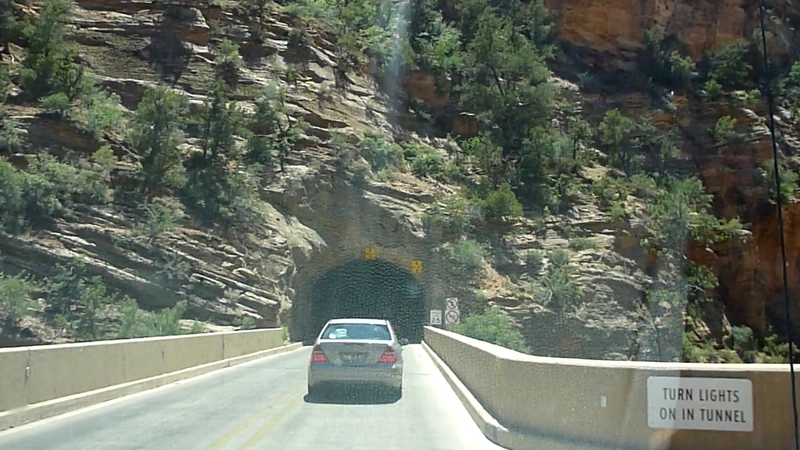 After the tunnel, there's a long and steep winding road that takes you down into Zion Canyon. Once we got back to the motor home, we got Mathea to the pool for a quick swim. We ended up leaving just as a large party got there - the pool went from nearly empty to completely full in the course of a few seconds, so our timing was perfect. Mathea was really tired today, probably because she didn't sleep well at the cabin (plus we've really been pushing to see a lot during our short trip). She had a little difficulty with supper (which she requested especially - Nana's American Chop Suey - a new favorite). We went back to the Virgin Trading Post around 6:30 for an ice cream and so Mathea could buy a toy she had liked from our previous visit, but they had unfortunately closed early. So we headed back to the RV park and bought some Ben&Jerry's at their convenience store for dessert instead.